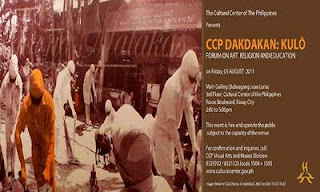 The Cultural Center of the Philippines presents “DAKDAKAN: KULÔ” An Open Forum on 05 August 2011, 2-5pm at the Bulwagang Juan Luna (Main Gallery). “KULÔ” is a group exhibition at the Cultural Center of the Philippines (CCP) Main Gallery showing until August 21, 2011. It was launched on June 17 on the occasion of CCP’s celebration of Jose Rizal’s 150th birthday. This exhibit was proposed to the CCP as the artists’ response to this important celebration, and makes the connection as well to the 400th year of the University of Santo Tomas. All the artists present themselves as Thomasians, products of the same institution, and thus regard to share a particular history and educational experience with Rizal. As the curators organized it, the exhibit called for direct or indirect representations, portrayals and recollections of Rizal as explored through traditional mediums, multimedia installations and graphic design. It hopes to contribute to the discourses of the pen and the sword, and of education and revolution— topics that continue to implicate Filipino artists and thinkers, who are conscious of the historical occasion and dialogue between Jose Rizal’s 150th birthday and the country’s oldest university’s 400th year celebration as an educational institution. This is more than a showcase of new or past works; but more of a gathering of ideas and ideologies, principles and disciplines, and past and present dialogues. “KULÔ” is not an official project of the UST; it is the initiative of the artists and curators involved in the exhibit. Now placed in the greater public eye is the current controversy sparked by one of the works, specifically “Poleteismo” by Mideo Cruz, an installation that has been exhibited since 2002 in venues such as the Loyola School of Theology in Ateneo de Manila University, UP Vargas Museum, Kulay Diwa in Paranaque City, and was also featured in the music video of Anghel sa Lupa by Stonefree. The “KULÔ” edition of this work has elicited protest from individuals and groups. Archbishop Oscar Cruz, former president of the Catholic Bishops Conference of the Philippines, has called for a boycott of the exhibit. Other organizations have also called for the removal of Cruz’s work, and even for the closure of the exhibit. Two constitutional rights have come into collision through this issue. On one hand is of course the artist’s freedom of expression, against which stands the complaint that the artwork is deemed to discriminate against religious belief. The CCP accepted the exhibition proposal and the artworks therein based on the determination that the premise of the exhibit and the works in question are legitimate art expressions by artists who have already established reputable track records through national and global awards, grants and expositions. Nonetheless, the CCP maintains that public reaction must be heard and addressed through structured and peaceful means. In recognition of such valid concerns, the CCP is organizing a public forum on 05 August 2011, 2:00 to 5:00pm at the Main Gallery, 3rd Floor CCP Main Building, CCP Complex, Roxas Boulevard, Pasay City. Educators, representatives of religious organizations, art practitioner and experts on culture and law will be invited to set the points of analysis and study with the aim of promoting exchange, and more importantly, the commitment for tolerance in both areas of art and religious practice. Dakdakan is an educational program of the CCP Visual Arts and Museo Division. The forum is free and open to the public, within the recommended capacity of the venue. Confirmation and seat reservation are encouraged. Please contact CCP Visual Arts and Museo Division at tel. 8323702 / 8321125 locals 1504 + 1505.